The day after then-No. 13 LSU upset then-No. 5 Tennessee 82-80 on what many were saying was some questionable officiating, a photo of one of the officials in an LSU shirt circulated around. There is a photo captured by Jayson Swain among others of referee Anthony Swain holding up an LSU shirt in front of him while on vacation in a gift shop out of the country. The day after then-No. 13 LSU upset then-No. 5 Tennessee 82-80 in overtime on what many were saying was some questionable officiating, an old photo of one of the officials with an LSU Tigers circulated around social media. The end of the game was chaos. Grant Williams, who scored inside with 33 seconds left to help the Vols force overtime, put Tennessee in front late in OT with a layup while he was fouled. However, Kavell Bigby-Williams tied it with a putback of Naz Reid’s miss with 6 seconds left. Lamonte Turner had a chance to win it for Tennessee but missed from 3-point range. A couple seconds remained as both teams scrambled for a long rebound. Javonte Smart, who scored a game-high 29 points, came up with it before Tennessee’s Williams collided with the Tigers’ freshman and was called for the foul, which led to the outcome. A day after the game, a photo of referee Anthony Jordan began circulating. Meanwhile, some Tennessee fans aren't taking their Saturday overtime loss to LSU very well. The same fan base that did its best to destroy the football coaching career of Greg Schiano has now gone after basketball official Anthony Jordan (9), who worked the LSU-Tennessee game and made the pivotal call in that game in the final second of overtime. A 2014 Facebook photo of Jordan ostensibly on vacation in Spain showed the ref holding up an LSU T-shirt he found in a store there, with the caption, "Strolling thru D-town Granada doing a lil site-seeing and look what I saw. To all my Bama's … Geaux Tigers …"
The photo, while hardly conclusive proof of bias, certainly is a bad look for someone whose job depends on impartiality. The SEC office issued a statement: "Anthony Jordan, the official in this social media post, has communicated to us that while traveling in Spain five years ago he saw the T-shirt from an SEC team for sale in a store. He took a picture and posted that picture to be seen by friends via his social media account. He said it was his intent to make a light-hearted social media post about having seen the T-shirt in another country and not to express affinity for a particular school. "Jordan has officiated at a high level in the SEC for 19 years, including 11 assignments in NCAA postseason tournaments. "We do not find this social media post to be acceptable with our expectations and will proceed accordingly, while also acknowledging Mr. Jordan has a lengthy track record as a fair and impartial basketball official." Anyone who has played or coached sports at any level — even the most basic levels — knows the code. We’re told from our earliest days in sports that blaming officials for a loss is wrong, because there’s always something we could have done better on our end. I’m over it. I’ve been over it for years. Especially in college basketball. We don't want to coddle young athletes any more than they're already coddled in this era, and it's important to always look in a mirror before criticizing someone else. But if you play hard and get a bad break, it's not wrong to be told the truth. Are referees the only reason Tennessee lost at LSU on Saturday? No. Of course not. Are referees one of the reasons Tennessee lost at LSU on Saturday? Yes. Of course. And any suggestion to the contrary is a level of naivety that borders on malicious. Here’s what makes it even worse, though: LSU coach Will Wade spent the entire game acting like a petulant child on the sideline, routinely tossing verbal abuse at officials, and he was never penalized for it. If anything, he was a squeaky wheel getting grease. That’s miles away from acceptable. Barnes doing anything less than creating a fuss about this would be a dereliction of duty. I think the veteran coach restrained himself rather admirably during his Monday press conference, but he didn’t deny his displeasure with the entire situation, and I don’t blame him. I’m not big on excuses. I try not to make them for myself, and I darn sure try not to make them for anyone else. But blaming officials for part of a defeat isn’t whiny, nor is it a pathetic excuse. Sometimes it’s the truth. And there’s nothing wrong with a coach speaking that truth to his players and even to reporters, at least in certain situations. SEC explained that Jordan made a light hearted social media post about seeing the LSU shirt in a gift shop in Europe of all places. 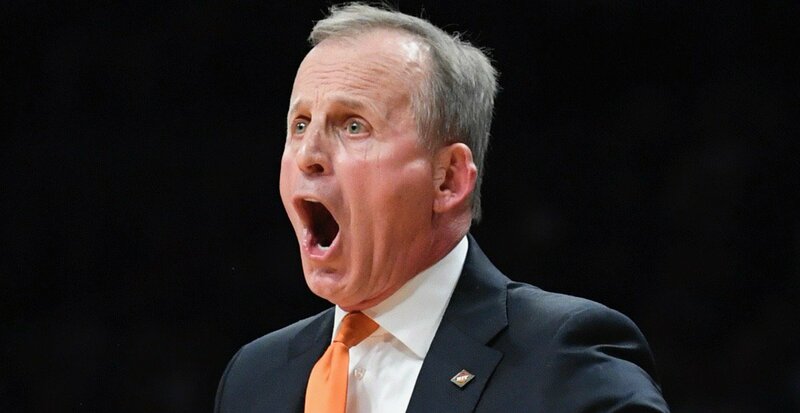 Per Jimmy, the ref was suspended at the time, has not worked an SEC game since, and will not work the SEC Tournament, including and especially, the Tennessee and/or LS games.